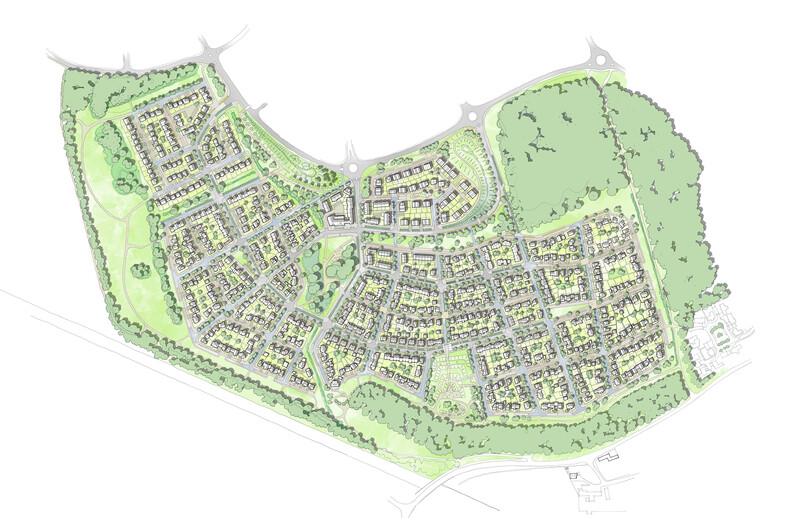 URBED were appointed by Siglion (a joint venture between Carillion and Sunderland City Council managed by igloo Regeneration) in December 2014 to produce a masterplan for a new housing development at Chapelgarth in Doxford, South Sunderland. The site was designated as a housing site to accomodate planned growth since it was included in the Unitary Development Plan, adopted in 1998. Sunderland City Council were in the process of updating plans for the entire South Sunderland area, and the site was included as part of the South Sunderland Growth Area Policy, which was open for public consultation. 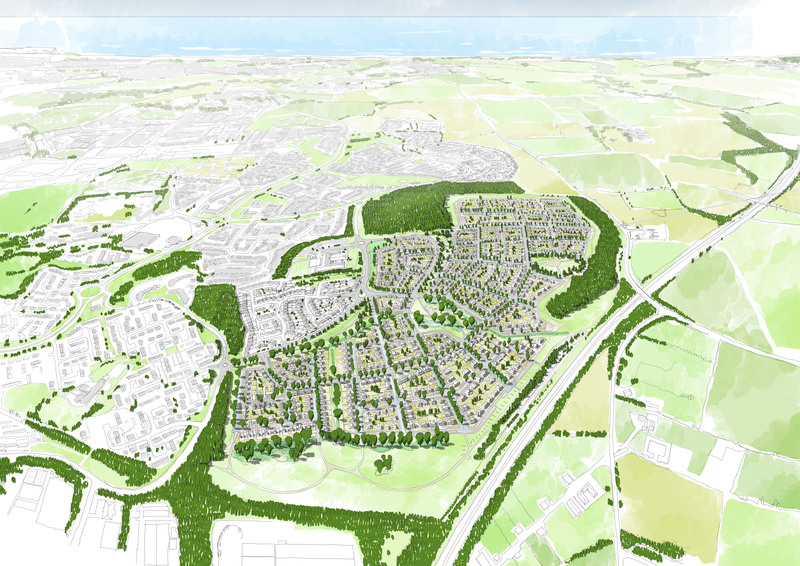 URBED worked within a multi-disciplinary team to bring forward an outline planning application for the site and worked alongside landscape architects Colour, planners and engineers Cundall and ecology consultants Argus. The objectives for the scheme included providing a new neighbourhood made up of several 'character areas' to create distinct village-type areas. The masterplan is interlaced with a high quality landscaping and public realm strategy which seeks to enhance the natural features of the site, and retain public pathways and bridleways throughout the site and onto the countryside areas beyond. URBED engaged with the public on the emerging masterplan proposals for the site. Chapelgarth Latest Masterplan: Tell us what you think! Following our exhibition at the Box Youth Project on Saturday 30th January 2016, the exhibition material and details of our latest masterplan for Chapelgarth are now available to view online. View the handout information from the event here which includes the technical notes and masterplan handout. Once you have had a look through, we would really appreciate it, if you could fill out an online questionnaire to provide us with your thoughts and feedback on the masterplan, survey link here. Please note the survey will stay open until 13th February. Numbers in the table below relate to those on the 3D aerial above. The designs for the landscape will be detailed in the Design Code, which will fixed as part of the outline planning application, ensuring the development is built out as intended. Weymouth Road: We have increased the green buffer between Weymouth Road and the new development in line with local resident’s comments. Drainage ponds will also be provided here as part of the drainage strategy. These will look like grassed basins and will only fill with water during extreme storm events. This means that most of the time they can be enjoyed as parkland. Central Park: At the heart of the scheme is a newly created neighbourhood park, which is defined by existing mature trees and hedgerows. A network of footpaths will permeate the park for recreational use. A play space will be provided in this area to attract young children and families. Allotments: Two areas have been allocated for the provision of community allotments. Panoramic Park: The panoramic park will take advantage of the elevated setting of the site and will provide a public open space for all to enjoy the views of the city and the sea. The earth modelling of the raised park will create a land sculpture and provide a focus within the development and a tranquil spot for the community. There are opportunities to provide play facilities for all ages within the park with associated seating. Magnesian Way: A generous green edge has been provided along the southern edge of the site. The proposals include the construction of a raised earth bund and green barrier to deflect noise from the A19. A multi-user route for equestrian, cycle and general foot traffic is proposed to the top of the bund to enhance views out to the sea and across Sunderland City. We are proposing to direct the W2W National cycle route onto our multi-user route, in order to move it away from the A19, and enhance users experience of it. Natural Greenspace: The proposals aim to maintain as much existing open space as possible. This area will be retained and enhanced to be enjoyed as open greenspace and will be allocated in the proposal as a ‘Sustainable Alternative Natural Greenspace’ (SANG). SANGs provide alternative recreational spaces which can help reduce visitor pressure on other areas along the coast which are home to protected bird species. We have allocated 13.5 ha of SANG on this masterplan and are proposing to add new footpaths to make it more accessible and link it to the existing cycle routes. Play Spaces: Play spaces have been provided throughout the new development in the form of doorstep parks overlooked by dwellings, larger equipped play areas within the Central and Panoramic Parks and natural informal play installations alongside the green networks. Pocket Parks: Small local parks have been proposed within clusters of housing to provide doorstep play and community seating areas within 3-5mins walk from homes throughout the development. The scheme can accommodate up to 750 new homes, providing a mix of types and tenures. All 3, 4 and 5 bed homes will have a minimum of 2 parking spaces. The density responds to the landscape design: higher density housing is situated towards the centre of the scheme to create a sense of place, like a traditional village centre, with lower density housing around the edges, which reflect the green and wooded areas around the site edge. Vehicular access into the site will be off three points on Weymouth Road. A primary route runs through the entire development and has been designed to accommodate a bus service. The residential street network will then feed off this route. Swales along streets to hold water. Swales are shallow vegetated channels designed to slow surface water run off. Drainage ponds - these will retain water in the event of a severe and prolonged storm, and will discharge it slowly into the water sewer, so as not to inundate it. Trees will be planted to capture surface water run off along new streets. We are providing 13.5 ha of natural greenspace which is the equivalent in area to 18.2 Football Association senior sized pitches. On top of this we are also providing parks, allotments, play spaces, pocket parks and new tree planting throughout the scheme. We are aware of the importance of the woodland and hedgerows around the site and we have incorporated into the landscape strategy the provision of green buffers. These indicate areas where no housing development can take place and include a minimum 25m buffer around woodland areas such as Blakeney Woods and a minimum 10m buffer around sensitive hedgerows. Our proposed public routes are based on how people currently use the site. We aim to provide a circular route through the natural greenspace, which also connects into the W2W cycle route to the south of the scheme. Pathways will also be provided within and around the new parks. Following the exhibition, we will collate responses and circulate these to the design team, before any final amendments are made to the masterplan. The planning application is due to be submitted for the scheme at the end of February 2016, after which members of the public will be able to comment on the application through the planning process. We have now been through all the completed questionnaires and wanted to share the results summary with you. We have written a short report which details the format, participation and results. This can be downloaded via the link to the right. Thank you to everyone who took the time to complete a survey and for your comments and feedback on the emerging design. The design team are now reviewing all the comments made and completing the technical studies required including traffic, ecology, drainage etc. Sunderland City Council have also recently issued a briefing note on the Sunderland South Growth Area and Chapelgarth's position within that area. This can be downloaded via the link on the right. We are keen to continue the discussion with local people to try and alleviate the community's concerns and adjust the masterplan where possible. We will be holding a further exhibition in early 2016 once the masterplan has progressed and we will advise you of the dates of this exhibition in sue course. October Exhibition: Tell us what you think! Once you have had a look through, we would really appreciate it, if you could fill out an online questionnaire to provide us with your feedback for the site here. (Please note the survey will stay open until 1st November). The masterplan is a work in progress, and we will be holding another exhibition in late 2015/ early 2016 to showcase the updated plans. We will be collating feedback from this exhibition and producing a summary report which will be made available on our website. The design team will then be using this feedback to inform the further development of the masterplan. The masterplan is a work in progress and we would appreciate your views before we draw up plans in more details. We will be consulting with the wider public on Saturday 17th October, 10am-4pm at the Box Youth Project, Hall Farm Road, to gather further comments on the proposals. We will be using feedback from both the workshop and public exhibition to inform the further development of the masterplan, before we exhibit again in late 2015/ early 2016.